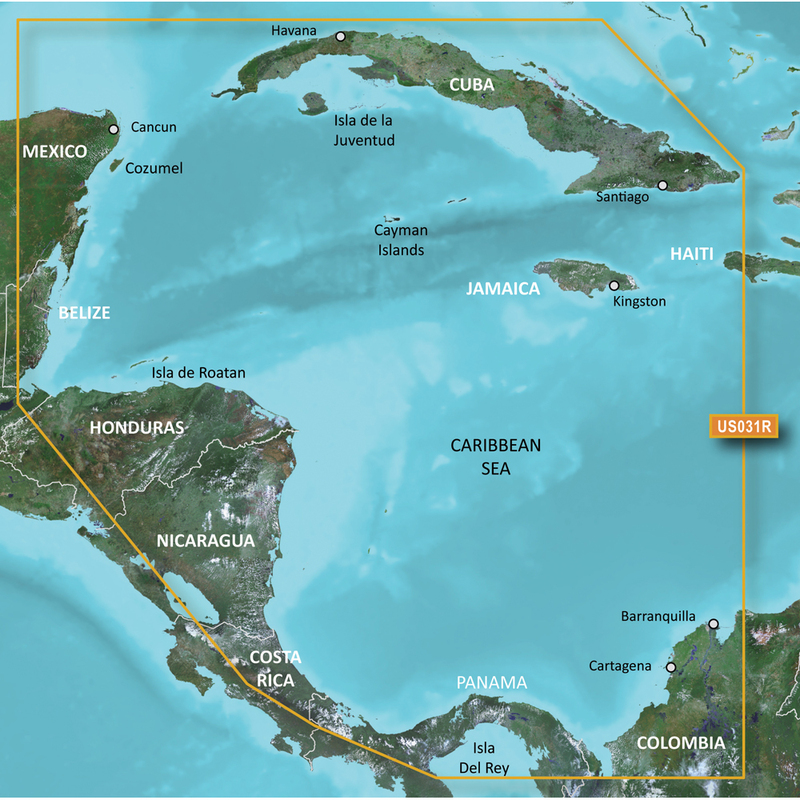 Detailed coverage of the northern coast of Central America from Cancun, Mexico to Barranquilla, Colombia, including the Panama Canal in its entirety. General coverage of the northern half of the Gulf of Panama. Also includes detailed coverage of the coasts of Cuba, Jamaica, and the Caymans in their entirety. Auto Guidance technology quickly calculates a suggested route using your boat's dimensions and a suggested path to follow. Displays high-resolution Depth Range Shading for up to 10 depth ranges so you can view your designated target depth. BlueChart g2 Vision HD features 1-foot contours that provide a more accurate depiction of bottom structure for improved fishing charts and enhanced detail in swamps, canals and port plans. Provides a 3-D representation of the ocean floor as seen from below the waterline. Provides a 3-D representation of the surrounding area both above and below the waterline. High-resolution satellite imagery with navigational charts overlaid gives you a realistic view of your surroundings so you can navigate with a clear moving-chart representation of your boat’s position. It’s our most realistic charting display in a chartplotter. Crystal clear aerial photography shows exceptional detail of many ports, harbors and marinas and is ideal when entering unfamiliar ports.